Note, this item is being offered as a reupholstery project. We can reupholster this in your material of choice or sell to you as-is so that you can select a local upholsterer of your choice. Price is as-is. 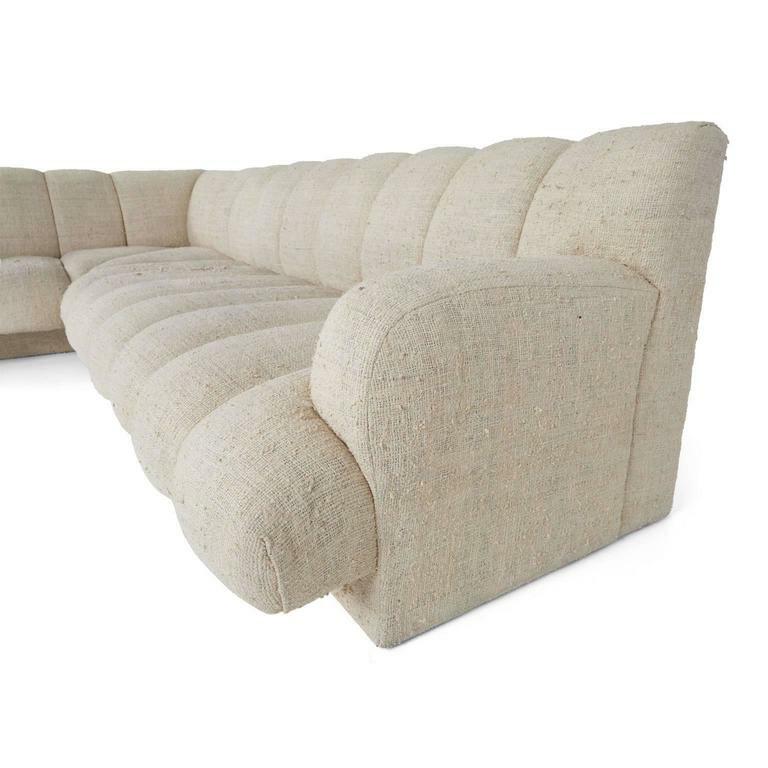 Contact us for a reupholstery quote if you would like us to reupholster prior to shipping. 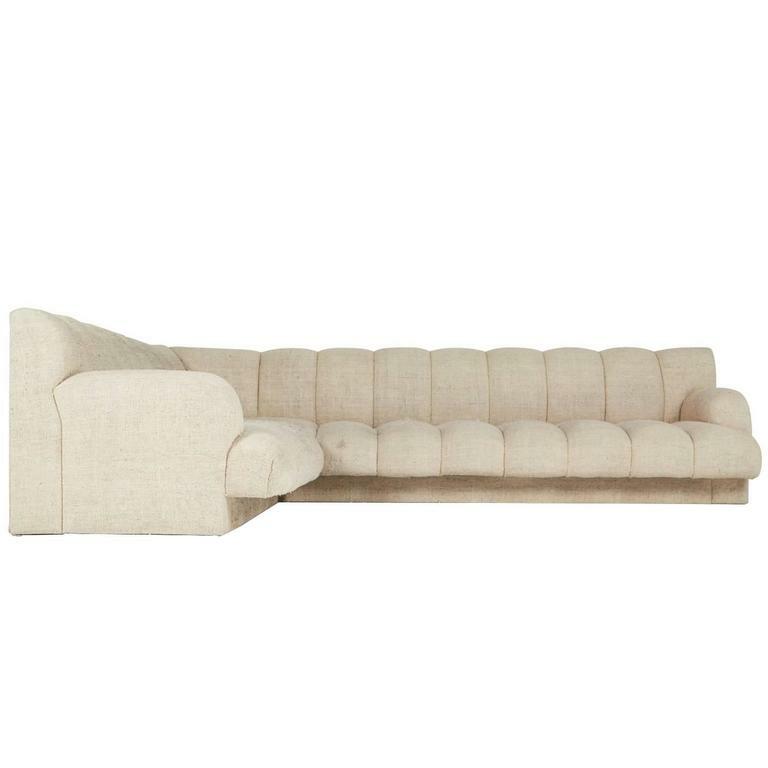 Inject some Palm Springs style into your space with this handsome sectional sofa created by iconic designer and Palm Springs resident Steve Chase. This piece embodies Chase's signature design aesthetic, as described in his own words; deliberate, unexpected and with a touch of humor. 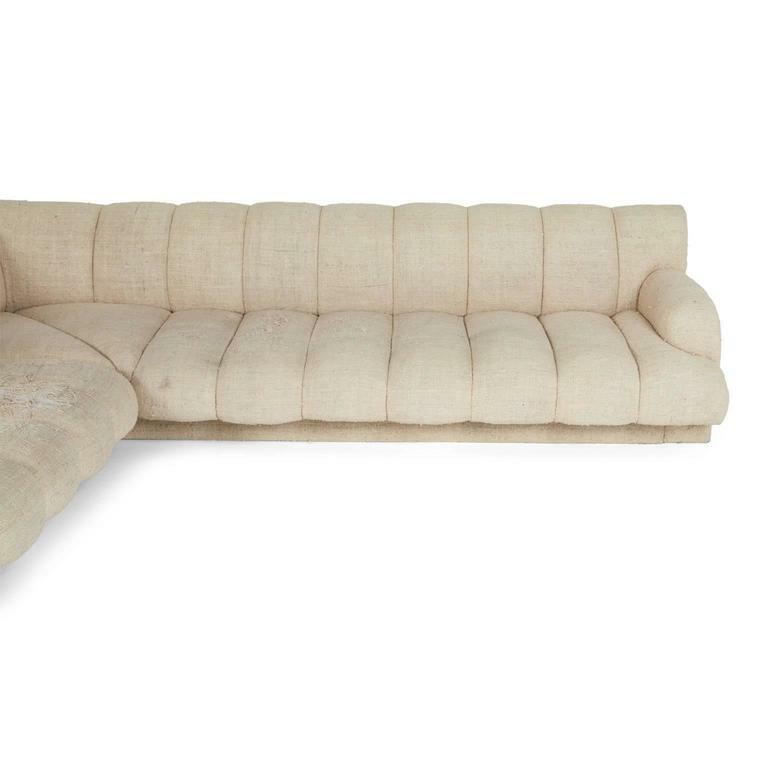 Acquired from a Palm Springs private estate, this expansive channel tufted L-shaped sectional was custom designed. 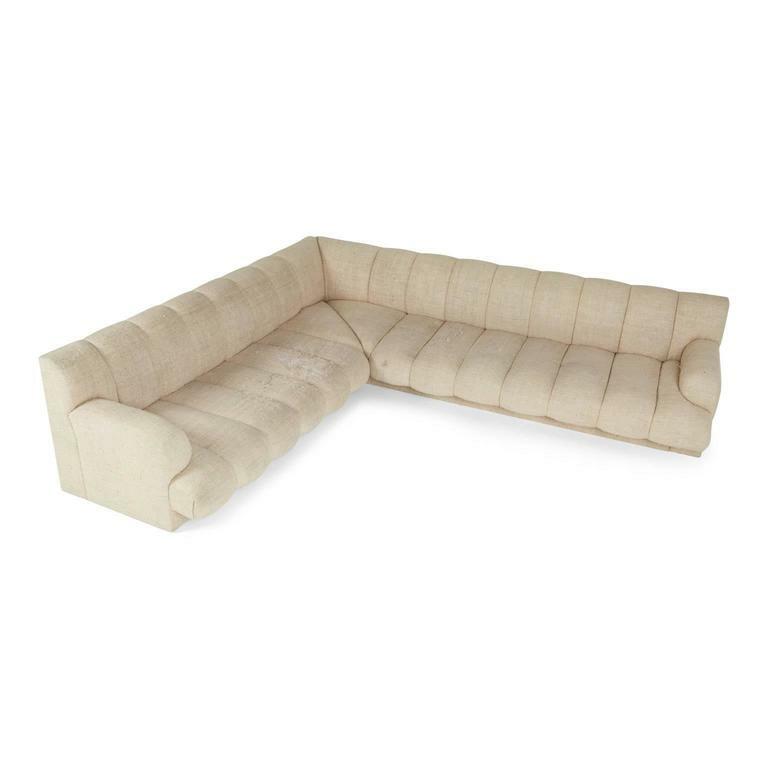 Channel tufting is currently a much-publicized trend and this piece is reminiscent of the award-winning decor of "The Gallery" inside "Sketch," the illustrious nightspot in Mayfair, London, by designer India Mahdavi. 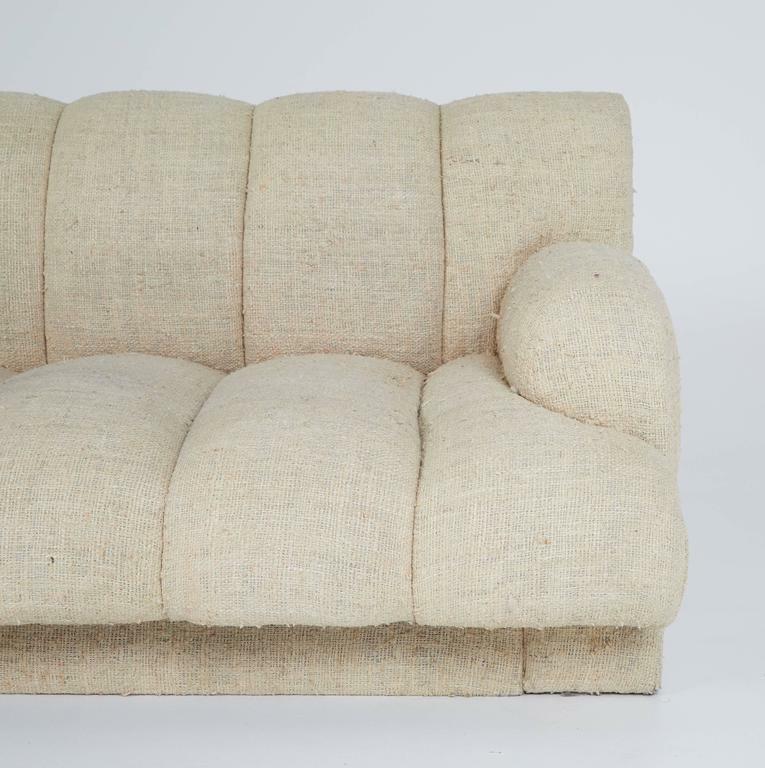 The sofa features an in-set plinth base, which gives the allusion of a floating seat, sturdy armrests, original neutral upholstery fabric and posses manufacture tag dated 5/27/1986. 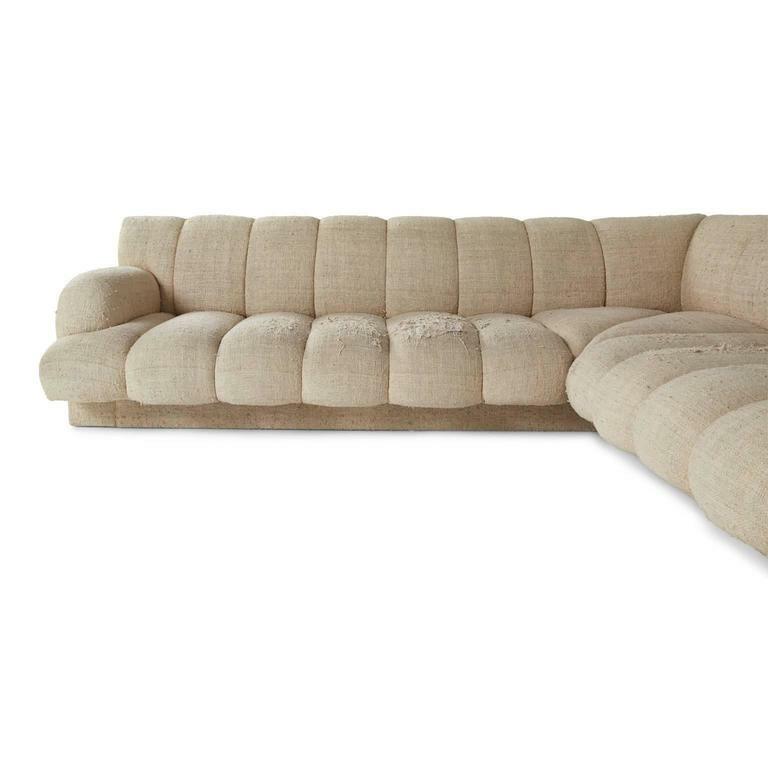 The L-shape design allows this sofa to be slotted neatly into a corner for optimal space or positioned in the center of an open floor plan. 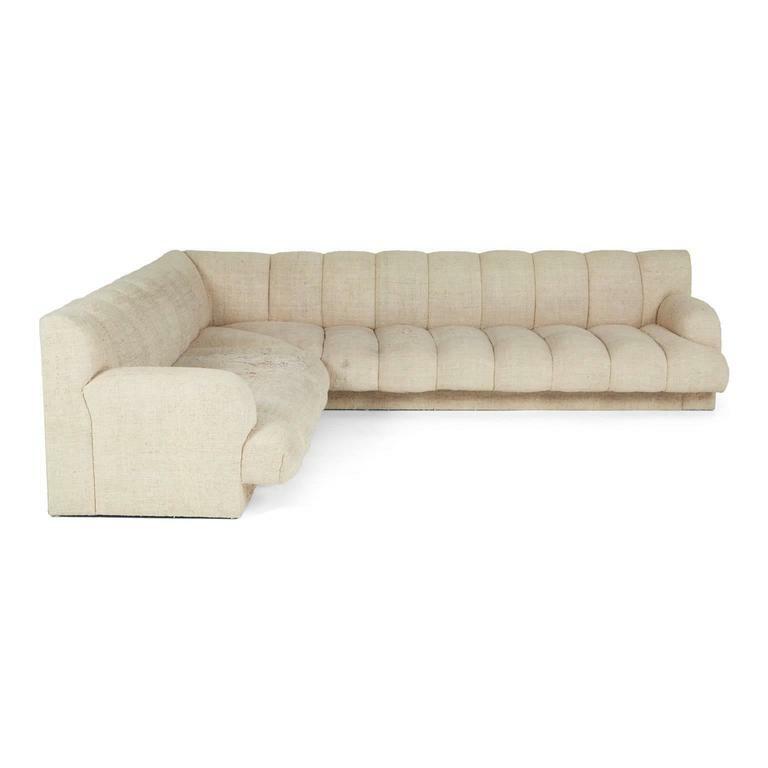 This sprawling sectional could be upholstered in a plethora of inspirational fabric or leather choices such as; a sumptuous navy velvet, understated black bull hide leather, textured neutral boucle, colorful shagreen or Palm Springs inspired tropical print. 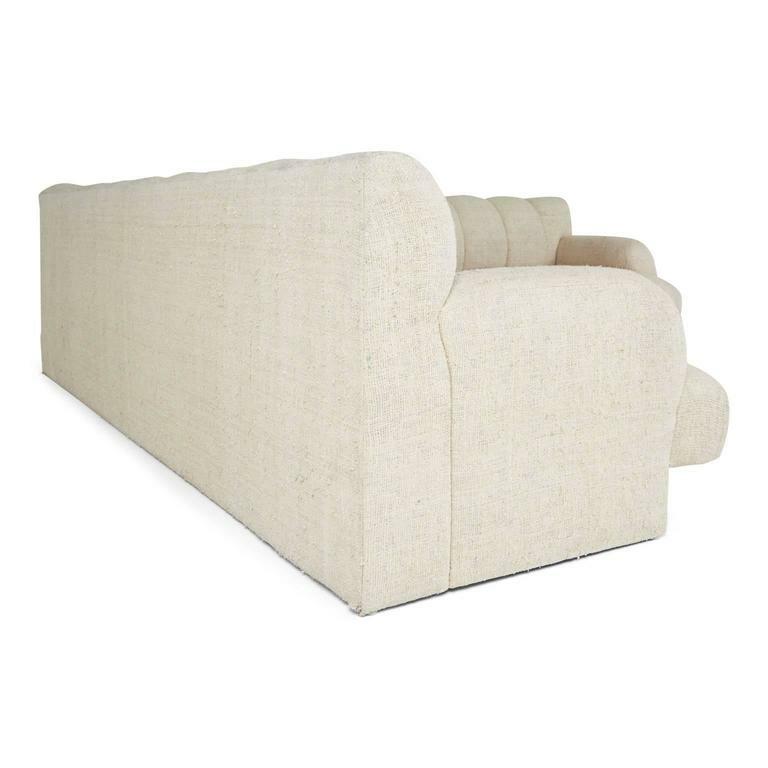 This sofa would be perfect in an airy open plan casita, Mid Century Modern desert dwelling, luxe contemporary penthouse or cozy dark walled den. It would also optimize alternate spaces such as; a boutique hotel lobby, chic cocktail lounge, exclusive members club, restaurant bar area or eclectic office space. Measurements: 31" Height 40" Depth 118" W, 1st section. 106" W, 2nd section. 16" Seat Height. 29" Seat Depth. Structure in very good condition. Fabric requires reupholstery. Please contact us for a full condition report. 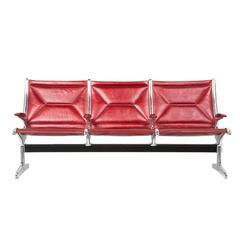 Please contact us for a reupholstery quote if you would like to receive prior to shipping. SEE ABOVE FOR FULL CONDITION INFO *Note, this item is being offered as a reupholstery project. We can reupholster this in your material of choice or sell to you as-is so that you can select a local upholsterer of your choice. Price is as-is. 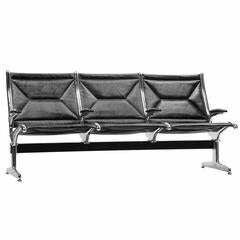 Glamorous channel tufted sofa by Steve Chase. The chic sofa has been newly reupholstered in a luxurious silvery grey chenille velvet. The sofa is accompanied by two matching pillows.